Have you ever set a goal, knew exactly what you wanted, knew what to do to get it, and yet you didn’t do it? Does this behavior drive you crazy? How about the other way around? You know there is something you need to stop doing, but no matter how many times you tell yourself to stop doing it, you do it anyway. You know it’s not good for you, but you can’t stop yourself. Have you done anything like this before? We all have at some point or area in our lives. You may have done it with food, or fitness, or a dysfunctional relationship. You’re smart, know what to do but just aren’t doing it. You know what not to do, but you just can’t stop yourself. This happens often and you are not alone. It’s not enough to just have goals. 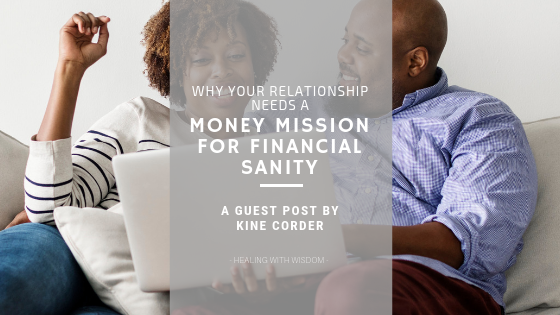 If you really want to reach your idea of prosperity in your relationship, you need more than a goal…you need a mission, and a strong why to go with the it. You need this because society created a set of beliefs and a program in place long before we made our first dollar. That program is, “do what I said,” “do what everyone else is doing,” and “you are not enough.” Are you familiar with these messages, in their many forms? The good news is, even though these patterns are deeply ingrained, they can still be changed. Even if you have earned your way to the top and have become the Joneses yourself, chances are it’s either lonely up there or you’re still climbing because you don’t know that you’ve made it. An earning goal is not enough to keep you feeling prosperous. You need to have an earning goal, a growth goal, a protection goal, a gifting goal, and a goal to enjoy your money. All of these goals are essential but the most important thing you need to know is your financial feeling. How do you want to feel when you get to your financial goal? What does prosperity look like for you? There is a dollar sign associated with it, but what else? Is there love, is there spiritually, is their wellness, is there something else? What do you need in your life to feel prosperous? All of this goes into your Money Mission. Every mission has a mission statement, so start by stating your mission as a couple. Your money mission statement describes how you will earn, grow, protect, gift, and enjoy your money. The mission keeps you on the path to prosperity. Without a written mission your goal can get lost inside the daily habits. The mission tells you what those daily habits should be. Daily habits, old beliefs, negative patterns, mental and emotional blocks can create obstacles along our path as we move towards our goals. Emotions start in the brain with a thought. Then that thought sends a feeling, and the feeling leads to an action. As you repeat the action it becomes a habit. To break the habit, one must shift by declaring their new mission first. Then use the mission to design a new healthy daily routine. There’s a little voice inside your head that says, “buy it,” or “you can’t afford it,” or “everyone else has one,” or “work harder and the money will come.” This voice keeps us connected to our patterns and old beliefs and we can’t get around the blocks unless we become aware of them. Writing and following your Money Mission Statement starts with you recognizing your old patterns. Then making a decision to do things differently. You can do this by making notes of your challenges, getting support along the way, and celebrating as you accomplish new milestones. When you put these things in place, you increase your chances of releasing the blocks and reaching your ultimate goals. Again, the components that will help you get to your goals, wealth or otherwise, are awareness, declaration, a clear plan, tight values, a support system and a strong why. Your Money Mission statement is the declaration of your values and a blueprint of your plan. The stronger the why, the stronger the mission. The strong why sits just outside the mission statement in your head, heart, and gut to remind you how important it is that you stick to the plan. Chose something that fuels you, because willpower will fail you. And when that willpower fails you, you will need to rely on your “why power.” That’s why it has to be strong. Whether it’s your children’s education, your parent’s retirement, your future comfort, or a cause that moves you, make it something you truly believe in. Stop driving yourself crazy feeling lost and repeating negative patterns that block you from your goals. Your Money Mission Statement is like a business plan for your life. It keeps you on track, it sets the precedence for your life, and it builds confidence. Not to mention the arguments that will be resolved by consulting the Money Mission Statements. Whether the argument is with your partner or with yourself, when you read your Money Mission Statement, it clears up any confusion and restores sanity. Make sure you and your partner are clear on your ideas of prosperity and share them with each other so that you can create a Marriage Money Mission together. Set your goal, find your why, write your mission, and stay on the path to prosperity. It doesn’t have to be lonely at the top, you can take people with you. I’d love to take you with me. Join the FREE Prosperity Club, get help writing your Money Mission, get resources that will help you keep your sanity while you create your idea of prosperity, and share your success stories with the community. For a limited time get a FREE discovery call when you Join the Prosperity Club. Discover your idea of prosperity with one of our trained wealth and wellness coaches. Become part of a discussion or sit quietly and learn from others, if that’s how you learn best. Either way, it’s time for you to continue your Money Mission with a group of lifelong learners who are on their way to the top. Find your mission and your tribe in the Prosperity Club Community. Visit kinecorder.com/discovery for more details. Kiné Corder is a National Certified Counselor, hypnotherapist, financial therapist and the CEO of Presidential Lifestyle. Her mission is to relieve the pain in the world by reducing the stress. Presidential Lifestyle is a wellness company focused on wealth in all of its forms. Helping stressed out employees and business owners reach their wealth goals without sacrificing their wellness or their relationships.